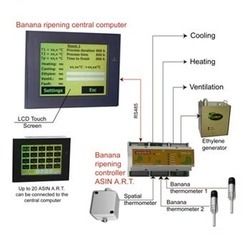 Our product range includes a wide range of banana ripening control system. We offer our esteemed clients a quality assortment of Banana Ripening Control System that are prepared under very careful guidance of our expert professionals who thoroughly check every single details of the manufactured and procured products with utmost care. By virtue of this, we are highly capable of meeting the exact demands of our clients in an efficient manner. Looking for Computerised Ripening Control System ?